Henry Hume Lloyd was baptised on 10th June 1834, the eldest of Edmund and Catherine Elizabeth Lloyd‘s children. He followed in his father’s footsteps and became a solicitor. 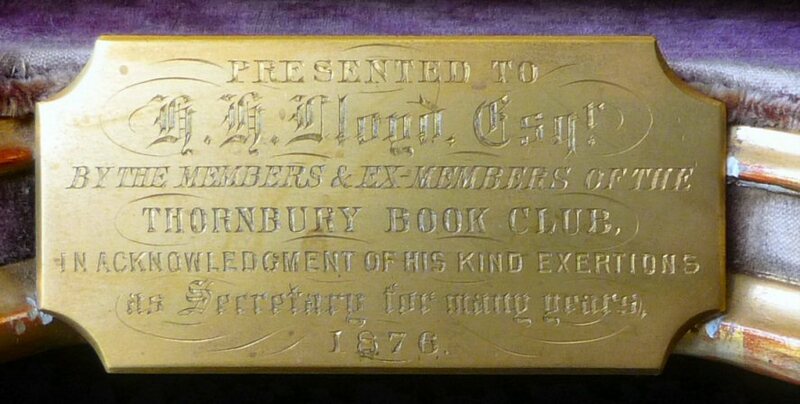 According to the notice board displayed in the reception of the firm at 12 The Plain, Thornbury, Henry joined the firm of Crossmans & Lloyd in 1857. The Trade Directories show that Henry was Solicitor, Commissioner of Oaths, Clerk to the Justices of Thornbury Petty Sessional Court and Highway Board, Registrar and High Bailiff of the County Court. The 1871 census shows Henry was living at Fairfield House with his mother and three of his siblings. In 1876 he married Helen (or Ellen) Maria Bond in Spilsby in Lincolnshire. Helen was the second daughter of John Bond Esq of Taynton, All Saints, Lincolnshire. They settled in Thornbury which is where they had two daughters, Dorothy, born on 5th October 1877 and Helen Margaret born on 3rd February 1879. Tragically Helen Maria died on 10th February 1879 aged 31, only a few days after her daughter’s birth. Henry was playing a very active role in Thornbury society. In 1861/62 he served as Mayor of the Thornbury. He took part in archery competitions and in 1870 won second prize at the Grand Prize Bow Meeting of Archers of the Channel. He was also involved with the setting up ‘Thornbury Football Club’ (which was at that time playing the rugby form of the game), and a member of the Gloucestershire Archaeological Society. 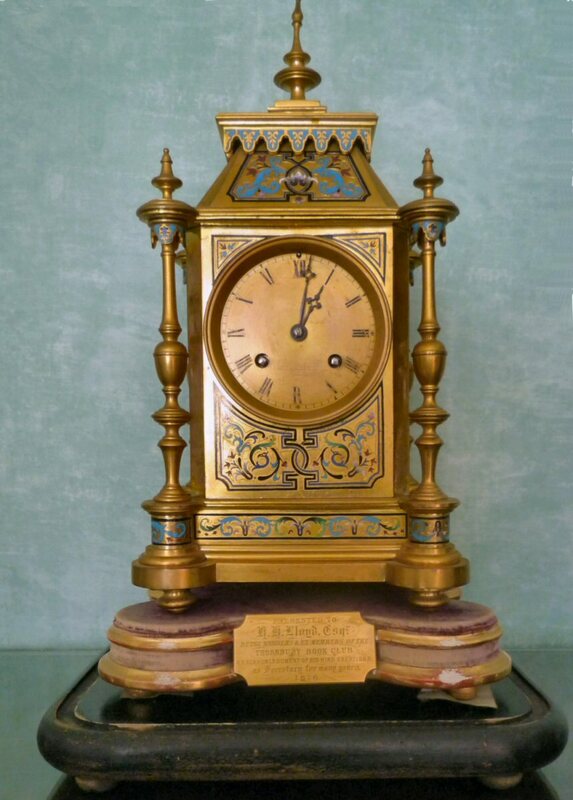 The two thumbnail images on the left are of a clock which was presented to Henry Hume Lloyd by the Thornbury Book Club in 1876. It refers to the fact that he had been secretary of the club for many years. Click on those two photographs to see larger images. In 1898 he was appointed Churchwarden at St Mary’s Church. We apologise for the quality of the photograph of Henry Hume Lloyd on the right. We would be grateful to hear from anyone who has a better image of this photo. The 1881 census shows Henry had taken over Fairfield House after his mother’s death. At the time of her death Fairfield House and gardens were valued at £1,500. In 1881 Henry was living there with his two daughters, Dorothy aged 3 and Helen Margaret aged 2. On 13th September 1887 Henry married again. This time his wife was Alice Commeline and they were married at St Michael’s Church , Gloucester. Alice was born in Moreton in the Marsh in 1857, the daughter of Thomas Commeline, a bank manager. Alice’s sisters, Grace and Edith Emily were also to settle in Castle Street and Edith Emily became the wife of Dr Lionel Williams of Wigmore House in 1891. Henry and Alice had two children by the time of the 1891 census: Edmund Commeline Lloyd born on 23rd July 1888 and Alice Magdalen born on 26th February 1890. They went to have two more children: Geraldine baptised on 8th December 1891 and Rachel Mary baptised on 6th May 1894. They were still at Fairfield House in 1901 census. Henry carried on living at Fairfield House and working as a solicitor at 12 The Plain until he died on 4th March 1904 aged 69. He was remembered by Frederick Henry Burchell as ‘Another important figure in Thornbury was Mr. Henry Hume Lloyd, Clerk to the Magistrates and Registrar of the County Court, sound in his judgement and anything undertaken by him was always done thoroughly well. He was also a churchwarden and a great pillar of the church’. The house at this time seemed to reflect the family’s connections to India, where Pamela herself had lived with her parents, and hunting. There were hunting scenes on the wallpaper in the downstairs loo but then that was the toilet intended for gentlemen. The hall had a tiger rug and the head of a boar both of which were victims of hunting trips in India. Pamela said she liked to cuddle the boar’s head. Alice also played a very active role in the Town. She was for many years Secretary of the Thornbury Nursing Association and a member and one time President of the Thornbury Women’s Institute. She had also taken a keen interest in the Thornbury Mothers Union and the Girls’ Friendly Society. Alice Lloyd occupied Fairfield House with her family until her death on 26th August 1934 aged 73. In 1925 when some adjoining property came into the market she took the opportunity of improving the house by the purchase of the field to the East of the house. The price paid was £275. Dorothy Lloyd – was born in 1877. She was baptised 4th November 1877 while the family still lived at Kington. The 1901 census shows her living with her parents in Fairfield House. Aged 23 she was unmarried. Helen Margaret Lloyd – was baptised 13th February 1879. She married Captain James Leopold Meyer on 3rd October 1901. James was born in 1867 in London, the son of Henry Meyer a merchant and his wife Elizabeth of Elm Park Gardens London. James had been appointed Second Lieutenant in the Royal Engineers in 1892. He was commissioned Deputy Lord Lieutenant of Middlesex in 1893. He served in in Simla in the Punjab where he died on 22nd June 1917. His army records show his widow’s address as Little Bocombe, Horn’s Cross in North Devon. He left his estate of £155 to Helen. Edmund Commeline Lloyd – was born 23rd July 1888 and baptised 2nd September 1888. He was the only son of Henry and his second wife, Alice. The 1901 census shows that he was a boarder in a private school in Clifton, Bristol. We have been told that Edmund Lloyd was to have worked in his father’s practice in Thornbury but he lost an arm in the First World War and went to live on Exmoor at Pittsworthy near Exford. His name appears in the Roll of Honour for 1915. He died in 1936 aged 48 in Exford. A Devon newspaper reported his sudden death. It described “Ned” as he was known as a notable sportsman and an intrepid follower of the Hunt. He was for many years apparently the secretary of the Devon and Somerset Staghounds. The article says he began his career as a solicitor and lost the use of his arm early in the First World War after which he took up farming. His widow was called Violet. Geraldine Lloyd – was baptised in Decmber 1891. In December quarter 1916, Geraldine married Lieutenant Alan C Taylor, the son of James Taylor of Helsby in Cheshire. He was serving in the Royal Engineers. The article in the South Gloucestershire Chronicle on December 22nd said that the eldest brother of the bridegroom, who had business in Liverpool and Chester, had died the previous Sunday in a motor cycling accident. The wedding took place quietly because of this and was only attended by close family. The bridegroom had 14 days leave for his wedding and his best man was Tom Commeline a cousin of the bride.